This trek to Hampta Pass and Chadratal Lake takes you to the gorgeous landscapes of Himachal Pradesh as you trek through dense forests and towering mountains. En route to Hampta Pass, you'll catch breathtaking views of the snow-covered mountains of Dhauladhar and Pir Panjal. As you climb uphill to an altitude of 14,000 feet, you'll spend your days hiking through thick jungles of pine trees and crossing rivers over dangling wooden bridges. In the evening, you'll reach picturesque locations where you'll spend the night in tents pitched under the star-studded Himalayan skies. Another highlight of the trip, you'll visit the famed moon-shaped Chandratal Lake and admire the barren and brown mountains that flank the still waters of the lake. Please note that a minimum of 2 travellers are needed to book this trek. Hampta Pass, located in the Pir Panjal mountains of Himachal, connects the neighbouring valleys of Lahaul and Spiti. The pass is surrounded by mountain peaks layered with thick snow glaciers, displaying the true natural beauty of the Indian Himalayas. Your trek to Hampta Pass also takes you to Chandratal, a high-altitude lake that is only open to travellers during the months of summer. Fed by the melting glaciers from atop lofty mountains, the lake is a must-visit destination for all travellers to Hampta Pass. • Trek to the Hampta Pass and Chandratal Lake in a single 6-day itinerary. • Climb uphill to an altitude of 14,000 feet along a scenic route. • Catch breathtaking views of Pir Panjal and Dhauladhar mountains. • Witness the change in scenery from green Lahaul valley to barren Spiti valley. Travellers are required to adhere to the instructions of the trek leader during the trek to Hampta Pass and Chandratal Lake. For cancellations made on or before 3 days prior to departure of the Hampta Pass and Chandratal trek: 30% refund. For cancellations made less than 3 days prior to departure of the Hampta Pass and Chandratal trek: No refund. A moderate level of health and fitness is required to book this trek to Hampta Pass and Chandratal Lake. If you have any cardiac or respiratory conditions, or suffer from knee or spinal problems, please inform the tour operator and consult your doctor before booking this trip. The tour operator reserves the right to cancel or alter the itinerary of the trek to Hampta Pass and Chandratal Lake to maximize the safety of travellers as well as staff. Arrive at the base camp in Old Manali by 09:00 hrs. Here, you'll meet the rest of the group and the trek leader, and attend a short orientation session. 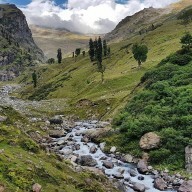 You'll learn about several packing and trekking techniques as well as general information regarding the route to Hampta Pass. In the evening, you can venture out to Manali to do any last minute shopping visit the town's famous Mall Road. Overnight at Manali in tents. Trekking through green carpeted mountains. You'll leave from the base camp by 08:00 hrs and board a jeep or similar shared, private vehicle that will drive you towards the Hampta Dam. This drive will take you through dense forests of maple, pine, walnut and oak trees. From the Hampta Dam, you'll continue the rest of the journey on foot. As you begin trekking towards Chikka, you'll cross wooden bridges and patch of dense forests before arriving at your destination in a couple of hours. Overnight at Chikka in tents. Wake up to the serene views at your beautiful campsite. Today, you'll trek towards Balu Ka Ghera. En route, catch breathtaking views of the snow-capped Dhauladhar mountains and the Indrasan peak. After crossing natural river streams over cobbled pathways through the forest, you'll reach Balu Ka Ghera by late afternoon. Overnight at Balu Ka Ghera in tents. Day 4 of the Hampta Pass and Chandratal trek: Hampta Pass! Today's trek will take you to the long-awaited destination of Hampta Pass. You'll begin trekking from Balu Ka Ghera and undertake a tough climb up to the Hampta Pass. From Hampta Pass, you'll catch glorious views of snow-covered mountain peaks and glaciers. You'll make your way down from Hampta Pass and reach Shea Goru. Overnight at Shea Goru in tents. Day 5 of the Hampta Pass and Chandratal trek: Chandratal Lake! Undertake an easy trek through the Hampta Valley as you descend down to the village of Chhatru. You'll catch spectacular views of the Pir Panjal and Spiti mountain ranges. If you arrive at Chhatru before noon and if the weather conditions are favorable, you'll board vehicles and head over to the famous Chandratal Lake. Spend some time at the banks of this beautiful lake and return back to Chhatru. Overnight at Chhatru in tents. If you were unable to visit the Chandratal Lake yesterday, you'll board vehicles and travel to the lake. Otherwise, you'll directly drive back to Manali and reach the city by evening. Your trip ends here. Visit the serene Chandratal Lake. Overnight at Manali in tents. Report at the base camp in Old Manali by 09:00 hrs. You'll be accommodated in tents on a triple-sharing basis. Sleeping bags and mattresses will be provided to ensure a restful night's sleep. The campsite is equipped with common kitchen/dining tents and toilet tents. Today's meal package includes dinner only. However, you can venture out to Manali and visit any of the restaurants and cafes to have additional meals at an extra cost. Overnight at Chikka in tents. You'll be accommodated in tents on a triple-sharing basis. Sleeping bags and mattresses will be provided to ensure a restful night's sleep. The campsite is equipped with common kitchen/dining tents and toilet tents. Today's meal package includes breakfast, lunch and dinner. Breakfast and lunch may be a packed breakfast and lunch en route to Chikka. Dinner will be served upon arrival at the Chikka campsite. Camping on green mountain carpets. Overnight at Balu Ka Ghera in tents. You'll be accommodated in tents on a triple-sharing basis. Sleeping bags and mattresses will be provided to ensure a restful night's sleep. The campsite is equipped with common kitchen/dining tents and toilet tents. Today's meal package includes breakfast, lunch and dinner. Overnight at Shea Goru in tents. Overnight at Chhatru in tents. Today's meal package includes breakfast before departure to Manali. Manali is well-connected to other major cities of the country via flights to the Bhunter Airport, located 2-hr drive away from Manali.